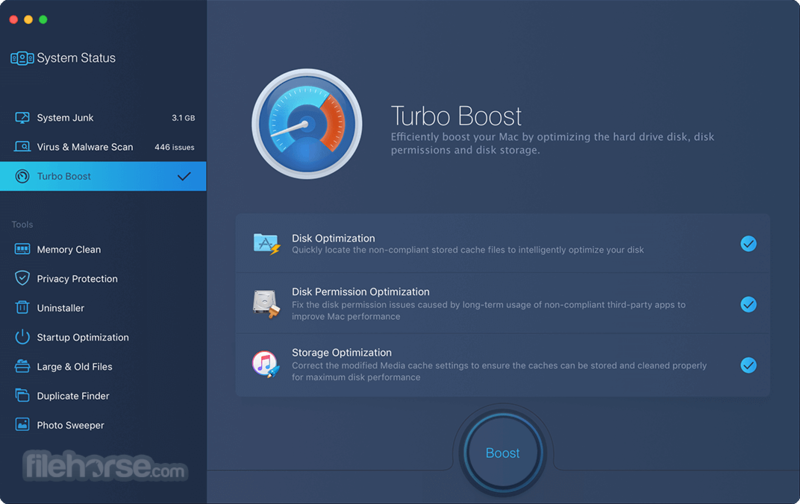 MacBooster is an easy-to-use yet powerful system utility for Mac OS users. Similar to Windows PCs, Mac computers also suffer from slow response, over occupied hard disks, difficulties in uninstalling apps, and other system issues. MacBooster for Mac can help users solve these issues with just one click. It clears out junk files in the system, detects and removes malware and virus, identifies big or duplicated files that take up large portion of hard disk, and helps you uninstall unwanted apps that won't easily go away. It is the ultimate tool you will need to keep your Mac machines running fast and safely. Keep your Mac away from all potential threat, like virus, spyware, malware, adware. Remove all kinds of junk files to free up more space for your Mac. Drive your Mac to peak performance by fixing Mac disk permission issues. Knowledgeable representatives available to help through free call and email response! MacBooster 6 for Mac scans every corner of your Mac and safely removes unnecessary files including 19 different types of junk listed below. Free up your Mac hard disk and give your more space to run your Mac smoothly. This is particularly helpful for Mac users with smaller hard disks. Mac gets slower and slower due to Mac disk issues. MacBooster 6 can optimize Mac hard disk and fix disk permission issues. Make sure your disk will always be the excellent status and boost your Mac to peak performance. With greatly expanded virus and malware database, MacBooster 6 is the best anti-malware to keep your Mac away from virus, phishing attacks, spyware, malware, and all kinds of online threats while feeling safe about your personal data. The Internet is something of a security minefield which is easy to get in trouble. The enhanced protection will clear the malicious tracking data to better protect your privacy and password for all kinds of accounts, leaving no room for all threats. Mac can slow down as more stuff is running in the system and The RAM is cluttering up. By using MacBooster 6 Memory Clean App, you can free up inactive memory for other tasks. The MacBooster Mini, which is standing by at the menu bar, offers more than what you can imagine. It shows you the usage of the memory and the status of network. At the same time, it offers you one click to clean memory, Cache, trash and optimize DNS. With the Lightning Booster mode, it can provide you with a faster online surfing experience. Manage your startup items to increase OS X boot speed. Boost Mac to Peak Performance. Find and remove large files for more space. Remove unwanted apps with just one click. Clean Mac memory to speed up. Delete similar and hidden copies of photos. Locate and smartly delete duplicates on Mac. Note: 14 days trial version. Requires 64-bit processor.